Washington state's governor says travel bans on immigrants and refugees have caused economic and moral wounds in the United States. Washington state's governor took aim at President Donald Trump in a speech to British Columbia's legislature Tuesday, saying travel bans on immigrants and refugees have caused economic and moral wounds in the United States. Gov. Jay Inslee said people are questioning whether the U.S. will continue providing leadership around the world as a result of Trump's presidency. "With everything happening in our White House in Washington, D.C., I know many nations have questioned our nation's leadership on some very important issues and have questions whether my nation will remain a shining city on the hill," said Inslee, who is a Democrat. Inslee drew a standing ovation when he mentioned Washington state's decision to join a lawsuit to prevent Trump's administration from deporting thousands of young immigrants brought to America as children and who live in the United States illegally, often referred to as "dreamers." "They are not a danger," he said. "They are dreamers." "I want to assure this assembly that no matter who is in the White House, it won't affect Washington state's relationship with Canada or British Columbia," he said. "It cannot stop us from moving forward on climate change." He said people living on both sides of the border do not want to see rivers without wild salmon or the Salish Sea without orcas. Battling climate change is what today's politicians will be remembered for a century from now, he added. 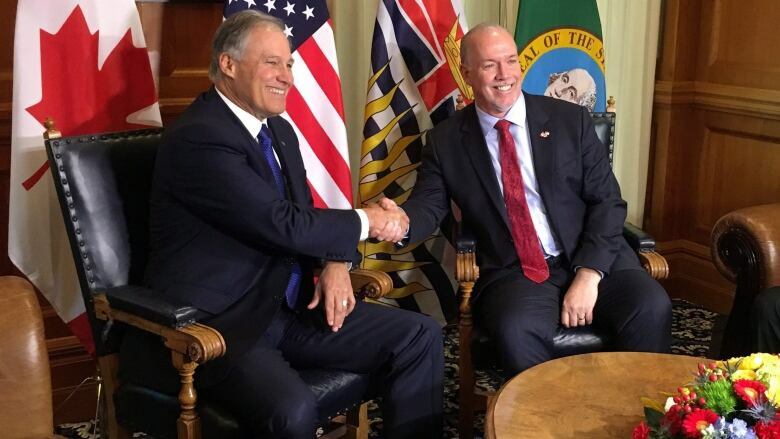 Inslee's speech did not mention the Trans Mountain pipeline expansion, which will increase oil tanker traffic on the West Coast. Prime Minister Justin Trudeau approved the project between Alberta and B.C. about a year ago. Canada's Pacific region and the U.S. west coast represent an economic, technological and environmental powerhouse, which could become the third largest economy in the world, he said. Inslee later urged people from British Columbia to travel to Washington state as an act of opposition to Trump's policies. "We cannot be daunted by this particular president," he told a news conference. "I don't want people in B.C. for one second to think about not travelling to Washington state because they are concerned about the president of the United States. Maybe as a show of defiance you ought to come twice as often."